The Arduino is a simple, open-source microcontroller board. Paired with a program that works as a development environment for writing software for the board, Arduino can be used to create a multitude of projects while also utilizing programming. Arduinos utilize a variety of switches or sensors as inputs, then uses lights, motors, and other physical outputs to create projects and interactive objects. In addition to learning the basics of circuitry and programming, Arduino enables the user to explore and prototype ideas. Play with one in the makerspace, or check a kit out from the Tech Desk! Arduino makes a variety of boards, or micro controllers, that users can experiment with. The most common, and the kind available in Tech Desk Arduino kits is the Arduino UNO. The board is what you will use to connect your circuits and upload programs. A supplemental board that assists the Arduino in modeling an experimental circuit. Jump wires connect different elements of the Arduino and Breadboard to form your circuit. Resistors "resist" the flow of electricity through a circuit. Measured by Ohms, Arduino kits come with a variety of resistors, each with different ohm levels. For more information about resistors and their uses, look at this information from Adafruit. LEDs are Light Emitting Diodes. Arduino kits come with a couple of different types of LEDs. Regular color LEDs come in yellow, red green, and blue. There is also one multicolor LED that can be used for projects. Sensors are able to perform a multitude of functions when used with Arduino. Light, sound, and stability sensors are among the types available in the Arduino kit. So you want to learn Arduino? Before you get started, make sure to download the Arduino software onto whichever computer you will be using (the software is free and open source!) Also, here is a quick reference guide to Arduino. 1. Check out one of the Arduino kits from the Tech Desk on the Lower Level of Belk Library. 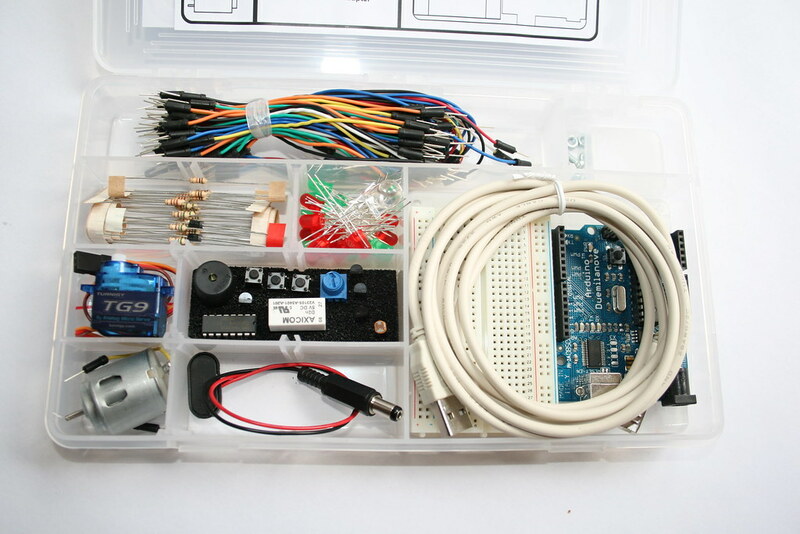 The Arduino kits have everything needed for beginners up to experienced tinkerers. 2. Read through the accompanying book. There are lessons and projects designed to teach you Arduino while getting hands on experience. 3. Once you have the basics, the possibilities are endless! Use Arduino for a wide variety of projects, including some of the ones below. Don't be afraid to experiment with new and different technologies! Monitor when your plant needs water then automatically add more, create a can smasher to recycle more easily, turn your room fan into a LED masterpiece, enhance your Halloween props, and more! Like Arduino? Check out the Intel Edison Internet of Things add on, or move on to the Raspberry Pi for more computer based projects. Not sure whether Arduino or Raspberry Pi will work for your project? Check out Make Magazine's helpful tips on choosing the best board. Need help? Contact Hannah Pope at popehl@appstate.edu for any questions! A list of Arduino recommended links for anything from components to design. Ideas and instructions for Arduino projects. Projects and learning materials. You can also buy boards and components. Arduino kit: oomlout via Flickr.